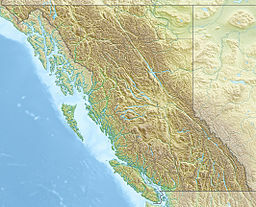 Mount Cayley is a mountain and highest point of the Mount Cayley massif between the Cheakamus and Squamish rivers in British Columbia, Canada. It has an elevation of 2,385 m (7,825 ft). ^ Kelman, Melanie Catherine (2005). Glaciovolcanism at the Mount Cayley volcanic field, Garibaldi Volcanic Belt, southwestern British Columbia (PhD). University of British Columbia. p. 30. "Mount Cayley". Geographical Names Data Base. Natural Resources Canada. Retrieved 2018-05-09. "Mount Cayley". BC Geographical Names. Retrieved 2018-05-08.